Spring Youth Education Programs: A Tremendous Success! across Delta, Mesa and even Garfield Counties! Rough Canyon Field Day: 25 students! In mid-April, 25 eighth grade students from Mt. Garfield Middle School in Grand Junction joined CCA, BLM, two members of the Ute Indian Tribe of the Uintah and Ouray Reservation (UIT), and some awesome volunteers for a day of stewardship and learning in the BLM-managed Mica Mine/Rough Canyon area. Students had the opportunity to participate in a cleanup of charcoal writing on the canyon walls and putting in some physical labor to restore a social trail that led to a vandalized rock art panel. However, the true highlight of the trip was interacting with UIT members Brock Chapoose and Betsy Chapoose. Betsy is the Director of Cultural Rights and Protection for the UIT and offered in-depth knowledge of rock art symbolism and Native American history and perspectives. Archaeology is Awesome in Dominguez-Escalante & McInnis Canyons: 174 students! In late April, 78 fourth grade students from Lincoln Elementary in Delta and 96 students from the Dual Immersion Academy in Grand Junction took part in CCA’s various Archaeology is Awesome events! Students learned about prehistoric lifeways of native peoples from across western Colorado and how contemporary members of some of these groups, like the Ute, remain connected to their ancestral homelands in these NCAs still to this day. Students examined rock art in Dominguez-Escalante NCA and visited Skinner Cabin in McInnis Canyons NCA. In both cases, the learning was hands-on as students were able to create pottery using traditional pinch techniques, to learn about storytelling traditions to then develop their own and to experience first-hand how archaic peoples used atlatls to take down big game prior to the invention of the bow and arrow. Escalante Field Experience in Dominguez-Escalante: 350 students! This year’s Escalante Field Experience, a joint venture between CCA, BLM, The Nature Connection, and Colorado Parks and Wildlife was a fantastic event. 350 seventh grade students from across Delta County participated in the event - hiking to the historic Gunnison Water Wheel, discovering dinosaur tracks in the sandstone, learning about Pinyon Jay life modes and lizard habitats, and discovering the history of American settlement in Dominguez-Escalante NCA at the Captain Smith Cabin. Nature Knowledge Days in McInnis Canyons: 850 students! As our flagship youth education event, Nature Knowledge Days for 3rd grade students in Mesa County was a huge success again this year. Over the course of two weeks, we brought over 850 third graders out into Devils Canyon within the McInnis Canyons NCA. Students rotated between eight different stations where they explored topics ranging from geology and biological soil crust to archaeology and historic ranching. Students braved inclement weather to learn from dozens of expert volunteers and receive their coveted stamps in their stamp booklets. Hilltop Youth Hiking Trip in McInnis Canyons: 10 students! Between the two weeks of Nature Knowledge Days, CCA took 10 students from the Residential Youth Services Program (RYS) of Hilltop on hikes through McInnis Canyons NCA. RYS houses students who have, for the most part, been recently released by the Department of Youth Corrections. For many of the students it was their first time off of the Hilltop Campus in over a year. These outdoor learning experiences are an immeasurable reward for their commitment to their schoolwork and self improvement, as well as a great extension to the core missions of both RYS and CCA. With a few more hikes and a raft trip slated for later this summer, we're very excited about continuing this great partnership with Hilltop as it allows us to bring the healing aspects of the outdoors to the kids that need it most. Thank you to all our Expedition Fund donors for helping to make this work possible! Colorado History Day in Dominguez-Escalante: 96 students! 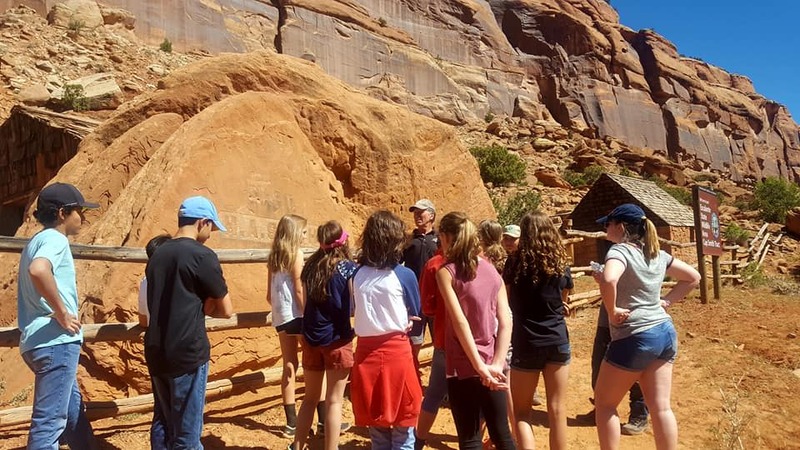 In mid-May, CCA taught 96 fourth and fifth grade students from the Dual Immersion Academy about the historical and cultural resources found in the Escalante Canyon Area of the Dominguez-Escalante NCA. Students were able to explore petroglyphs, riverside ecologies, historic pioneer cabins, and mutualistic animal-plant interactions in a rigorous, standards-based way. Paleontology with Silt Schools in McInnis Canyons: 70 students! At the end of May, 70 fourth grade students and their teachers came down from Silt in Garfield County to learn about the rich paleontological history of the McInnis Canyons NCA at the Trail Through Time. Students previewed the quarry site and new interpretive materials, along with experiencing a fossilized Camarasaurus skeleton with CCA staff, and Museums of Western Colorado and BLM volunteers. Teacher Training with TEN Program in McInnis Canyons: 12 teachers! Our commitment to youth education extends to making sure that teachers have the best information year-round. This year CCA participated in the Teaching Environments Naturally (TEN) teacher education program hosted by Colorado Parks and Wildlife. CCA took teachers from Mesa County out into McInnis Canyons NCA to educate them about the historic, cultural, geological, and paleontological resources of the area and the various ways in which they (with support from CCA) can use these resources to help reach their students throughout the school year. This program has been highly successful in the past and CCA is excited to be a partner in this opportunity to get teachers and their students out into the NCAs! Education Committee, click here and sign-up today! Newer PostCCA and Museums of Western Colorado Team Up! Older PostMusician Shaun Ray's Passion for the River Makes Cents for CCA!